Made by NAiS in Japan. Isuzu All Models From (1990 - 2010). Genuine4 PINBlack Multi-Use Relay. Good Working Order. Condition: Used and Good Working Order. Vauxhall Opel Frontera A. We specialise in parts for Vauxhall cars from the sixties and seventies and have little knowledge on more modern cars. 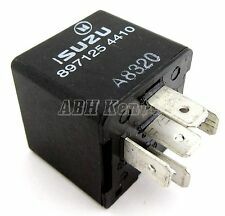 Isuzu Trooper 3.1 Multi Position Multiple Use 5-Pin relay. Genuine Isuzu part. Every single individual item I list has its own photographs taken, unedited, in the interest of authenticity. The item you will receive, is the exact one shown in the pictures. 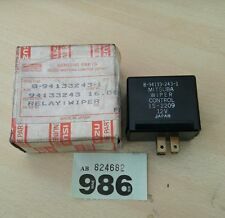 GARAGE CLEAR OUT FOUND THIS RELAY PART No 94133243 SEE PHOTOS. Made by OMRON in Canada. Isuzu All Models From (1990 - 2010). Genuine5 PINBlack Multi-Use Relay. Good Working Order. Condition: Used and Good Working Order. ISUZU TROOPER SUV 2000- 2005 RELAY (Removed from a right hand drive car). THIS VEHICLE PART WAS REMOVED FROM A YEAR 2004 ISUZU TROOPER CITATION DT LWB 3.0 TURBO DIESEL ( Engine Code 4JX1) 5 SPEED MANUAL. 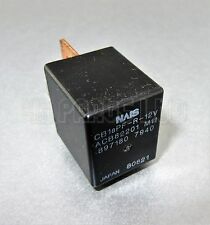 Isuzu & Mitsubishi (1990-2012) 4-Pin Black Relay MR301978 NAiS ACB82201-M09 80925-2510 12V. Made inJapan by NAiS. Genuine4 Pin Black Relay / Multi-Use Relay. Isuzu Almost All Models (1990 - 2012). Mitsubishi Almost All Models (1990 - 2012). Tyco Part Number:V23134-J59-X428. Madeby Tyco. Genuine5 Pin Black Relay/ Multi-Use Relay. Madeby Omron in Thailand. 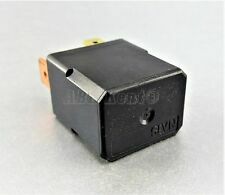 Genuine4 Pin Micro Black Relay/ Multi-Use Relay. Fits both LHD & RHD cars. Good Working Order. Made inJapan by NAiS. 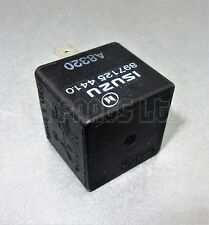 Genuine4 Pin Black Relay / Multi-Use Relay. Isuzu Almost All Models (1990 - 2007). Mitsubishi Almost All Models (1990 - 2007). Fits both LHD & RHD cars. Good Working Order. Made inCanada by Omron. Genuine5 Pin Black Relay / Multi-Use Relay. Isuzu Almost All Models (1990 - 2010). Good Working Order. 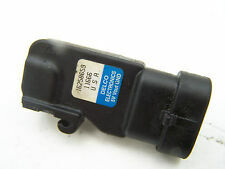 Tyco Part Number:V23134-J59-X404. Madeby Tyco. Genuine4 Pin Black Relay/ Multi-Use Relay. Esto se debe a que damos precios para largas distancias desde el Reino Unido. Podemos ayudar si es necesario. Isuzu Trooper/Bighorn/Monterey Mk2 Gen2 3.1 TD. Manual gearbox. LWB 5-Door model. Isto é porque nós damos preços para longas distâncias do Reino Unido. Madeby NAiS in Thailand. Genuine5 Pin Black Relay / Multi-Use Relay. Isuzu Almost All Models (1998 - 2012). Mitsubishi Almost All Models (1998 - 2012). GenuineIsuzu / Mitsubishi Part. Isuzu Trooper/Bighorn/Monterey Mk2 Gen2 3.1 TD. Manual gearbox. LWB 5-Door model. Isle of Wight, Scottish Highlands and Islands of Scotland:- HS, IV, KA27-28, KW, PA20-49, PA60-78, PH17-26, PH30-44, PH49-50, ZE, Channel Islands (Jersey & Guernsey), Isle of Man and Isles of Scilly and Northern Ireland :- IM, TR21-25. Isle of Wight, Scottish Highlands and Islands of Scotland:- HS, IV, KA27-28, KW, PA20-49, PA60-78, PH17-26, PH30-44, PH49-50, ZE, Channel Islands (Jersey & Guernsey), Isle of Man and Isles of Scilly and Northern Ireland :- IM, TR21-25. Isuzu Trooper Mk2. SECURITY MARKS. You must check to make sure this item fits your vehicle. unless otherwise stated, our parts are off the shelf so may have storage marks on them. GLASS AND BODY PANELS. From an Isuzu Trooper DUTY /Bighorn/Monterey Mk2 FACELIFT Gen2 3.0 TD 4JX1 Manual 1991 - 2002 (colour: 858 Bright Blue) that we are breaking. El precio que se muestra es incorrecto. Entre em contato comigo para o transporte internacional. 2005 ISUZU RODEO 2.5TD 2X4. COMPATIBILITY IS FILLED IN TO THE BEST OF OUR KNOWLEDGE. 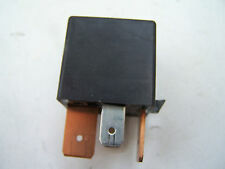 Isuzu Trooper 3.0 MK2 91-02 black relay NAIS 897180 7940 8971807940 . El precio que se muestra es incorrecto. Entre em contato comigo para o transporte internacional. O preço apresentado é impreciso. They MUST be refurbished by a brake specialist before fitting to the vehicle. 2004 ISUZU RODEO DENVER 3.0TD. COMPATIBILITY IS FILLED IN TO THE BEST OF OUR KNOWLEDGE. PART NO GM 94040240. ISUZU BEDFORD PICK UP. X 2 RELAYS. FOR YEARS: 2002, 2003, 2004, 2005, 2006 (2004). All products are security marked using a paint system, alloy punch and or Ultraviolet security pens which only show under a UV light system. Highlands and Islands may be more expensive. 2011 ISUZU RODEO DENVER 2.5TD MANUAL 4JK1. COMPATIBILITY IS FILLED IN TO THE BEST OF OUR KNOWLEDGE. OPEL - VAUXHALL - ISUZU ORIGINAL PARTS - GENUINE PARTS. FILTERS, BADGES, BRAKES, HEADLIGHTS, WHEEL BEARINGS, GASKETS AND A LOT OF CLASSIC STUFF AND SO ON AND SO ON. That is basically the original part used by the car manufacturer on the car when it left the factory. OPEL - VAUXHALL - ISUZU ORIGINAL PARTS - GENUINE PARTS. GRAB A BARGAIN!! I HAVE CLUTCHES, CABLES, VALVES, PISTONS, PISTON RINGS, CRANKSHAFT BUSHINGS. SO I'M NOT SURE WHAT CARS/MODELS/YEARS THESE PARTS FIT ON BUT I'LL TRY TO DO MY BEST TO HELP YOU. OPEL - VAUXHALL - ISUZU ORIGINAL PARTS - GENUINE PARTS. GRAB A BARGAIN!! FILTERS, BADGES, BRAKES, HEADLIGHTS, WHEEL BEARINGS, GASKETS AND A LOT OF CLASSIC STUFF AND SO ON AND SO ON. That is basically the original part used by the car manufacturer on the car when it left the factory. OPEL - VAUXHALL - ISUZU ORIGINAL PARTS - GENUINE PARTS. MOVANO INSIGNIA CAMPO . ASTRA VECTRA ZAFIRA . FILTERS, BADGES, BRAKES, HEADLIGHTS, WHEEL BEARINGS, GASKETS AND A LOT OF CLASSIC STUFF AND SO ON AND SO ON. Model: Trooper. Engine capacity: 0. FOR ISUZU D-MAX, 2008 YEARS. HAVE SCRATCHES FROM USAGE. ITEM IS IN GOOD WORKING CONDITION. SOLD AS PICTURED.